Submitted photo Marie Reedy explaining how to date old family photos at the February Rebecca Galloway Chapter DAR meeting. 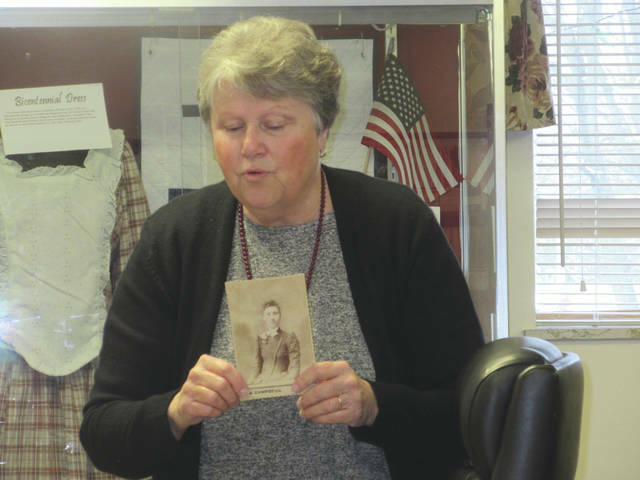 ENON — Marie Reedy of the Rebecca Galloway Chapter DAR presented a program on saving and dating old family photos at the February DAR meeting at the Enon Community Historical Society’s Research Room. First, she explained that the current use of digital photography produces pictures that will not last. She advised participants to purchase typical “wedding-cameras” that used film, have them processed professionally and save the negatives produced by the film for any treasured family pictures. Next, Reedy explained about several photo techniques that were used during the mid and late 1800s. Some of the most common include the Daguerreotypes – (1840s – 1850s) an image on a silver clad copper sheet which was then sealed inside a wooden case or framed under glass. Tintypes – (1856 popular until 1867) an inexpensive process on a thin sheet of blackened iron, not tin. The name might come from the fact that tin snips were used to cut the iron plate. Cabinet Cards – (began 1866, popular from 1870 – 1895) a larger version on the carte-de-visite (visiting card), images were mounted on heavy card stock to prevent curling that were frequently displayed in cabinets or bookcases. Reedy said to date the photos, members should look at clothing, what the photo was printed on, what process was used, and the paper type. She gave attendees a quick dating chart and a bibliography of research sites for identifying and dating old photos. She also had suggestions of places to look for dates — paper dolls, Godey pictures, Library of Congress for old newspaper ads as well as Ancestry.com sites that can be used at local libraries. Reedy spent some time helping members date the family photos brought to the meeting and closed with more information of places to research the history of family treasures. https://www.fairborndailyherald.com/wp-content/uploads/sites/50/2018/02/web1_Marie-Reedy.jpgSubmitted photo Marie Reedy explaining how to date old family photos at the February Rebecca Galloway Chapter DAR meeting.